NilKontho Pakhir Khoje (Part-1 and 2) by Atin Bandyopadhyay ebooks pdf. Atin Bandyopadhyay born in 1337 (BS), in the village of Rainadi, Dhaka district. His notable novels are Manusher Gharbari, Aloukik jolojan, Ishwarer Bagan. Now I'll share with all my respectable readers a very popular novel of his written NilKontho Pakhir Khoje (part-1 and 2) which is story about partition of Bangladesh. 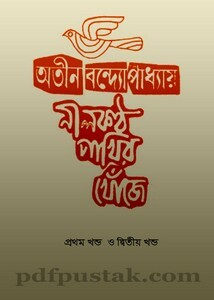 There is a lot collection of Bangla book and their pdf files are available on the website. All these stories, novel, sci-fi, historical, scripture, children and various type of books are written by the various prominent authors and pdf files are uploaded by various web friends. Welcome to this site, collect all the ebook totally free of cost.